Born and raised in Thunder Bay, Ontario, Canada, Kevin Durand has starred in several movies and television series. His roles include the Archangel Gabriel in Legion, Fred J. Dukes aka the Blob in Wolverine and the villainous Martin Keamy in Lost. 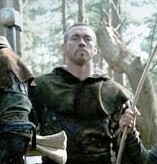 Reprising a role he once played on stage, Kevin Durand plays Little John in the 2010 Robin Hood film starring Russell Crowe and directed by Ridley Scott. This interview was conducted by phone on May 7, 2010. AWW: I wanted to ask you about playing Little John, which I know you've done before this. KD: Yes, I have. This was obviously on a completely different scale. [Laughs] I played it in a pantomime in Toronto, probably about 14 years ago. 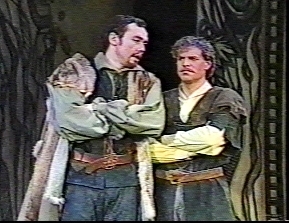 [The 1996 version of Robin Hood: A Merry Family Musical starring Dan Chameroy which became a 1997 TV special.] This time around required a lot more commitment and it was probably one of the best times I've ever had. AWW: So, what was involved in taking a legendary character like Little John and investing him with a humanity for modern films? KD: First off, I had auditioned quite a while ago. I had auditioned in June of the previous year on tape for Ridley doing a different accent. Then I found out that I was his first choice. And once I found out about that then I became very committed to it even though I didn't get an offer right away. I was told that he was going to be a Scotsman, so I packed my bags and went to Scotland. I travelled around Scotland trying to find which exact dialect I wanted to do for him and get a much better sense of the Scottish people. I was in Scotland for almost two months and I finally found what I had been looking for. I got the offer for the movie about three months after that. And then we were off in full motion to tackle these great historical, legendary characters. AWW: What sort of Scottish accent did you give Little John? KD: Well, I spent a lot of time in Glasgow. I really liked the sound. I really liked the harshness to it. It felt right for him. I couldn't do an exact Glaswegian accent because the accent in the 12th century, there were certain things that they did, certain consonants that weren't used whatsoever in the accent. I basically did a Glaswegian accent but pulling out what we call glottals from certain words. Mostly I think people would think I was from Glasgow. AWW: I understand that the Little John in this film is perhaps getting back closer to the ballads in that he's clever. I understand that he's an engineer in the film. KD: Yeah, he's basically a head engineer in King Richard's army. From the research that I had done ... I didn't watch any of the movies to find him. I guess the feeling I got from film and TV incarnations kind of suggested that he was a little bit rotund, big, jolly and maybe not the smartest fella. The reading I had done -- I just got a different sense. Russell and I had a conversation about it, and I said "should I put on some weight? Be jollier looking?" And we had both decided that he should be a leader of men, and he should live up to his reputation as being a man of the forest. So we lifted a lot of weights and ate properly and I became really obsessed with my war staff and away we went. AWW: What can you tell me about Little John in the film? KD: I don't know what I can tell without giving anything away. I think you're just going to get a good, multi-dimensional character who's a kind of balls to the wall ... excuse my French ... kind of fella who really cares a lot about his mates. He's been living day to day in this war, just fighting to stay alive. And he and these other fellas have found refuge in the fact that they love to gamble, drink and sing songs. I think he's got a lot of dimension. I hope he's a lot of fun to watch. He was to me. AWW: When you were doing research, did you read any of the ballads? KD: I did read some of the ballads. I read one ballad that kind of steered me in the direction I ended up taking. I'm curious to see what historians will think of my interpretation. I think I kind of get back to the more original descriptions of who he was. Other than the fact that I'm not quite 7 feet tall like they say he was. I'm about half a foot off the real Little John. They found like his femur bone [in Hathersage, Derbyshire] and once they put all the math together he was actually seven feet tall which I'm a little short of. Vertically, but not on attitude. AWW: There have certainly been a lot shorter Little Johns on film. KD: [Laughs] I'm probably the tallest that's ever been portrayed in film. I sit around 6'6" - 6'7", depending on how I feel on the day. AWW: So, did you sing much in the film? I know Russell Crowe and especially Alan Doyle have done some. KD: I think that was a big part of Russell and Ridley's vision in finding the Merry Men. To be able to show people why they were labelled the Merry Men. And to him that has a lot to do with that we love to sing and drink and have a good time as well as the other side where we're great warriors. Singing was a big part of it. I've been singing for my supper way before I was acting for my supper. 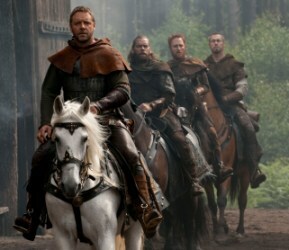 So, Scotty [Grimes, the film's Will Scarlet], Alan [Doyle, Allan A'Dayle], Russell and I, we all had a ball. We would set up at bars all over London, have a few beers and take up the guitar and start singing. We would have a really good time with the patrons. I don't think we had a bad show to date. We were pretty lucky. AWW: I know that you had worked with Russell Crowe and Scott Grimes before. KD: Russell, Scotty and I met on a movie called Mystery, Alaska which started back in 1998. That was my first movie. It was my first audition for a movie actually. I was a theatre grad up to that point. Then Russell and I also did 3:10 to Yuma together. Scotty and I did a movie together. It was called Throwing Stars at the time and then they changed the title to Who's Your Monkey?, a small independent. So, we were all very familiar with each other. And the connection with Alan was that I had been a huge, huge Great Big Sea [Alan Doyle's folk band] fan way back before Mystery, Alaska happened and I gave Russell and Scotty copies of his CD. And they all became big fans. Through the course of a decade of different things happening, we all ended up becoming good friends and becoming the Merry Men, so to speak. I'm grateful for the journey. AWW: What was your first impression of Robin Hood growing up in Canada? KD: Canada is really interesting in the kind of media that we get. There's a very strong mix of American media as well as British media. So growing up Robin Hood was very big. I remember being a child playing in my neighbourhood. Some kids played cops and robbers. Some played cowboys and Indians. I remember us playing Robin Hood. I didn't get to be Little John because I was a lot younger than the other kids. So I was just one of the many Merry Men. But it was a very big part of the stories and myths and legends that we read about. AWW: So, what do you think the appeal of Robin Hood is? KD: The appeal of the legend overall, or the appeal this film might have for filmgoers? AWW: How about this film? KD: I think for the first time we're actually going to deal with the origins of the story. This man must have done some pretty grand, amazing things if his story has lived through time for over 1000 years. I think that Ridley Scott and Russell really found a way to tell that story, to make sense why it has lasted so long. I think that's a really exciting take on it. I hope everyone else is as excited about it as we are. AWW: I know it has the big opening at Cannes in a couple days. KD: It's very exciting. Actually I'm talking to you while we're shopping for my better half, finding her beautiful, fancy things to wear. So, hopefully we do get a sequel so I can pay for this stuff. AWW: Thank you very much for your time. KD: Thank you for all your support. I hope you enjoy it. , includes both the theatrical version of the film and an extended director's cut along with several special features. Buy Mystery, Alaska - a film which stars Russell Crowe and his future Merry Men co-stars Kevin Durand and Scott Grimes. 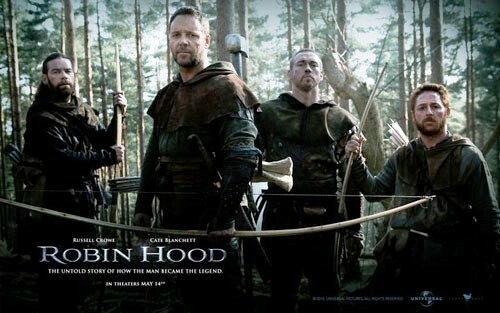 Buy Robin Hood - Extended Director's Cut on Amazon.co.uk , also includes the theatrical version. Buy Mystery, Alaska [DVD] - a film which stars Russell Crowe and his future Merry Men co-stars Kevin Durand and Scott Grimes. Buy Robin Hood [Blu-ray] (Bilingual) on Amazon.ca , includes both the director's cut and the theatrical cut along with many special features. Interview text, © Allen W. Wright, 2010. All text, unless otherwise noted, and title graphics - © copyright Allen W. Wright, 2010. Photos from Robin Hood are copyright Universal Pictures and used with permission. Photos from Robin Hood: A Merry Family Musical is copyright Ross Petty Productions and used without permission under fair use.